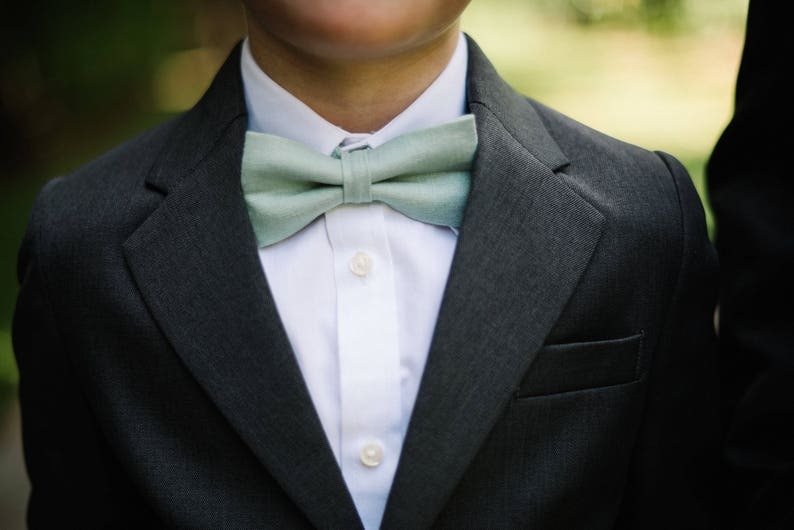 These boy's bow ties are made from designer cotton fabric in "Dusty Shale" - its a gorgeous shade of mossy green with a hint of grey. I specifically chose this fabric to match J.Crew's Dusty Shale bridesmaid dresses. You can purchase a swatch and coordinating items in my shop. More sizes and styles are in my shop. If you don't see what you are looking for, just ask! Absolutely obsessed with these bow ties. Our primary wedding color is dusty shale and it's been pretty difficult finding quality bow ties that match, until we found Emy's store. We also bought suspenders from her and would highly recommend purchasing from this store. Emy is quick in responding and provides high quality work. We're so happy an excited to have our ring bearers wear these. Can't wait for my little Ring Bearer to wear this! It is so adorable and just as I imagined! The owner was also very helpful with questions and shipped very fast!